British Airways' cabin crew plan to strike for five days from Monday, May 24. 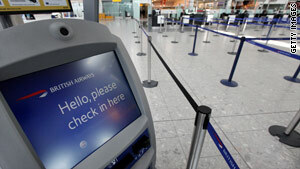 London, England (CNN) -- British Airways and the union representing its cabin crew were holding talks Saturday aimed at heading off a series of three planned strikes, the group mediating the talks said. The two sides were meeting at the central London headquarters of ACAS, the Advisory, Conciliation and Arbitration Service, a spokeswoman said. It wasn't clear whether BA and the Unite union were meeting face to face. The first strike is due to start Monday and last for five days. Two others are scheduled soon afterward, all part of the union's long-running dispute with BA over pay and working conditions. "I believe that there is a window of opportunity this weekend for a negotiated settlement to be achieved." ACAS chief conciliator Peter Harwood said in a statement given to Britain's Press Association. "If an agreement is not reached this weekend, there is every possibility that additional pressures on both sides will ensue which will make a final resolution more problematic." The Unite union, which represents almost all of BA's 15,000 cabin crew members, went on strike over the issues twice in March, grounding flights and causing travel chaos for thousands of passengers across the globe. Talks since then have failed to resolve the dispute, leading Unite to call the strikes this month and next. Unite Joint General-Secretary Derek Simpson said Saturday a resolution was possible, hinting that the only sticking point remained BA's revocation of travel perks for those staff that went on strike in March. "We can reach a settlement here, but he's got to turn around and remove those vindictive, petty sanctions," Simpson told Sky News.